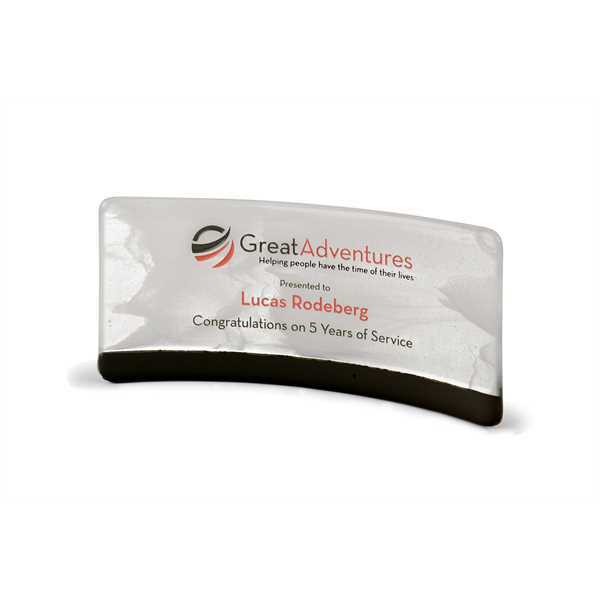 Size: 9 " x 4 " - Our artistic glass desk awards are made with beautifully striking artistic glass colors. Reflecting wispy features run organically throughout the glass with a black accent. Each hand crafted work of art incorporates art glass that is artistically formed to shape. Deep etched copy is color filled to provide contrast with the flow of the glass. Choose from two standard sizes and a variety of artistic glass colors. One colorfill included. Size: 9 " x 4 "
Imprint Size:8" x 2.375", 8" x 4.375"